Elements of Oil and Gas Well Tubular Design offers insight into the complexities of oil well casing and tubing design. The book's intent is to be sufficiently detailed on the tubular-oriented application of the principles of solid mechanics while at the same time providing readers with key equations pertintent to design. It addresses the fundamentals of tubular design theory, bridging the gap between theory and field operation. 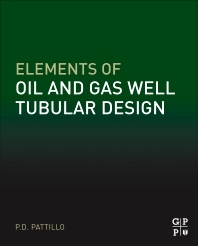 Filled with derivations and detailed solutions to well design examples, Elements of Oil and Gas Well Tubular Design provides the well designer with sound engineering principles applicable to today's oil and gas wells. Phillip Pattillo, PhD, currently works on a contract basis in Houston, Texas. He retired as a Distinguished Advisor in Exploration and Production Technology after over 40 years service for BP America. Phillip was active in API/ISO Subcommittee 5 with multiple leadership roles including that of US Representative and document editor to ISO TC 67 / SC 5 / WG 2b, whose purview includes the fundamental equations for rating oil country tubulars. He was awarded the SPE Drilling Engineering Award in 2009, SPE Paper of the Year, and awarded for his service by the API Executive Committee on Standardization. Phillip has written numerous conference and journal papers. He earned a BS in Mechanical Engineering from Louisiana State University, an MS in Engineering Science from Louisiana State University, and an MS and PhD, both in Engineering Science from the University of Notre Dame.